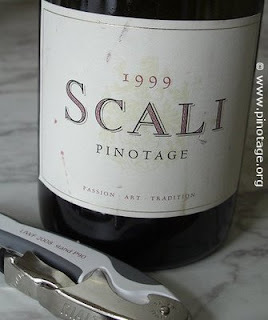 Scali 1999 created quite a stir when it came top in a blind tasting in Cape Town in February 2003 organised by David Brice at the Wine Cellar. Very few people had heard of Scali. It was a new label, the first vintage from Willie & Tania de Waal who sold most of their crop to a co-operative but had retained a little for themselves. They made only Pinotage and Syrah and fermented each in large open topped wooden vats making just 25 barrels of each. Willie told me they wanted to restrict production to just what Tania and he could make on their own without any assistance. The name is based on the Afrikaans for the local shale soil type. I thought the 99 Pinotage had a sweet smoky nose, bags of sweet fruit, refreshing summer pudding flavours and a medium aftertaste. But when I later tasted the 99 it seemed to have entered a dumb period. Would it ever recover or just die? Last night, five years later, I opened another bottle to find out. It is holding up well. Very soft and smooth, no noticeable tannins, bit of acidity, sweet subdued fruit. Reminiscent of an aged claret. Excellent food wine. Pinotage - "leaves you in utter exhilaration"